﻿ Pattaya Bay Resort (Thailand) | FROM $21 - SAVE ON AGODA! "Will return for sure wish it was closer fab people." "Good location value 4 money would stay again"
Well-positioned in Central Pattaya, Pattaya Bay Resort is the ideal point of departure for your excursions in Pattaya. Only 1. Km from the city center, the hotel's strategic location ensures that guests can quickly and easily reach many local points of interest. With the city's main attractions such as Mc Donald's, Slices Pizza, Alibaba within close reach, visitors to the hotel will just love its location. Pattaya Bay Resort offers impeccable service and all the essential amenities to invigorate travelers. Guests of the hotel can enjoy on-site features like free Wi-Fi in all rooms, facilities for disabled guests, Wi-Fi in public areas, car park, room service. In addition, all guestrooms feature a variety of comforts. 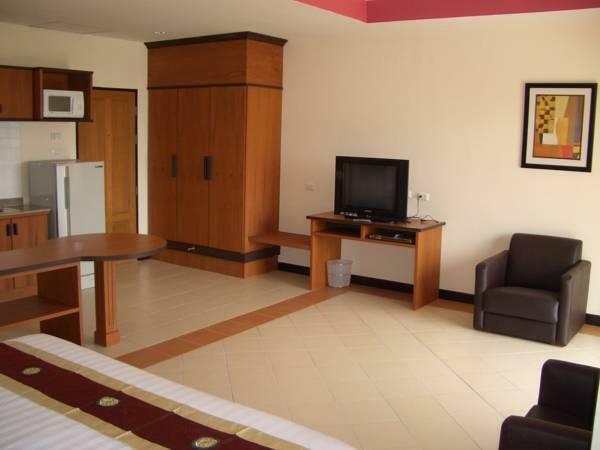 Many rooms even provide television LCD/plasma screen, air conditioning, desk, balcony/terrace, telephone to please the most discerning guest. The complete list of recreational facilities is available at the hotel, including fitness center, outdoor pool. Enjoy unparalleled services and a truly prestigious address at the Pattaya Bay Resort. "A clean value 4 mone hotel would stay again"
I enjoyed my stay at this hotel. It was clean,the room was comfortable and the staff was polite and efficient. Checking in and out was simple and quick. The wifi worked well and there was a good selection of TV channels. The central location was convenient. Very good value for money but understand that the hotel is NOT the hotel pictured on the Agoda site ! 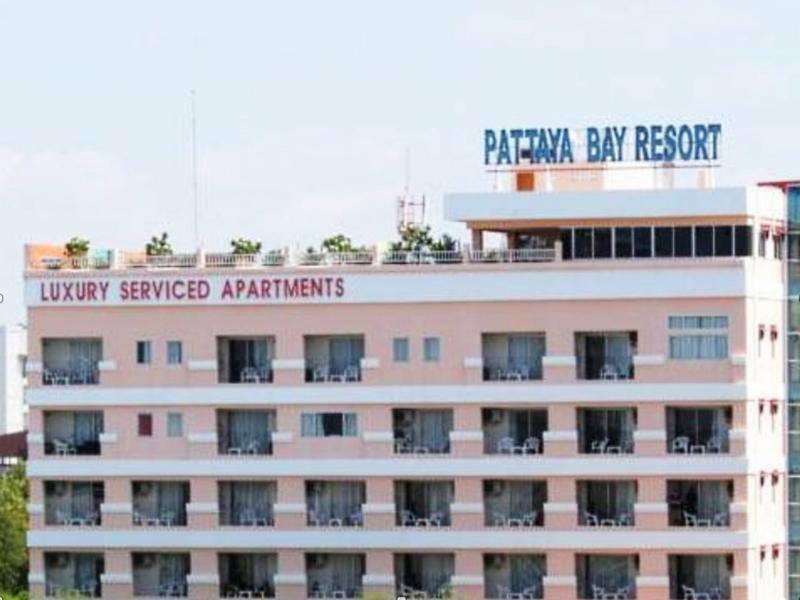 That is a photo of the Pattaya Bay Apartments and residences , which is next door and is a higher class establishment. Agoda please note and correct this as it causes confusion and disappointmemt and only because I am nice I would complain strongly about this misrepresentation. However, we were happy with the hotel we stayed in for the price we paid. There was an issue with the pool as my partner suffered bad eye stinging after her swim and we had to go to the pharmacy. This had not happened in any of the other 3 hotels we stayed in this holiday. Perhaps she was just unlucky, i had no problem , so it is not certain that it was the water in the pool. A good hotel as I said. I have stayed her a few times, the rooms are clean, has a large fridge in room, king size bed, typical Thai style bed (hard) and a verandah. Staff are helpful, although I don’t really need their assistance apart from check in and check out as I know my way around here. I choose to eat out although you can opt for breakfast at the hotel. The restaurant is on the 7th floor overlooking the pool. The Wi-Fi I had in my room was fantastic - fast. For four years now, I have chosen to stay at Pattaya Bay Resort. When I travel to Pattaya with my mate, we prefer to be in the center of the city, within walking distance or a short baht bus ride away from all of the city's main attractions. 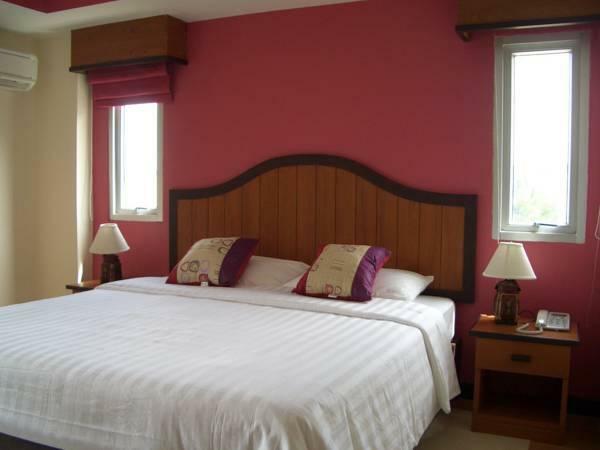 The location of this hotel is great, just off 2nd Road behind the Avenue Mall, on Soi 15. It's tucked away down the driveway so the hotel itself is very quiet. I have learned, though, that this property may undergo renovations as early as May or June of 2016, and while the renovation will be gladly welcomed, I'm sure it will change the price of the rooms. One of the great things about staying at the hotel are the prices of the rooms. They are spacious, clean, have king sized beds, air con, a fridge, safe, television, closet, western bathroom, and good free wifi. The hotel and rooms are a bit dated, but for a budget 3-star hotel, you get plenty for what you pay for. The hotel has a restaurant upstairs which serves complimentary western or Thai breakfast (if you pay for the breakfast option with your room). The hotel also has a laundry service which is convenient for my longer stays. Security is excellent, and there are no extra fees for a guest. I am always satisfied with my experience at Pattaya Bay Resort as the staff know me by now, and always make each of my stays pleasant. They even have a free tuktuk that will take guests to 2nd road or Soi Buakhow 24/7. I will hope this property remains a great value after their renovations. I had stayed here before in a larger room and this time I booked the smaller room. Initially I was not impressed, I room changed and was much happier. There in an apartment building under construction at the back of Pattaya Bay Resort, my first room was in the 7 floor facing the back and nothing but dY noise and a view of the green dust protection just meters from my balcony. I stayed 2 nights in this room then I moved in the night. What impressed me the most was the receptions attentiveness and caring approach. I work in Hotels and this kind of service is why I came back. I was only scheduled for 7 nights and I ended up staying another 5 nights. The lobby is beautiful, even the security staff at the door always said hello to me. I had a motor bike accident and took a lot if skin from my knee, without asking the housekeeping staff saw the blood in my bed and informed the reception and they came to my room to attend to my knee. Outstanding.Team. Thank you. This is a nice hotel in a great location at a very good price. The hotel is in the center of Pattaya, a 5 minute walk from 2nd Road, but while it's close enough to the nightlife to be convenient, it's far enough away to be quiet. (Quiet except for the temporary construction going on next to it.). Check in and out were quick and simple and the staff was polite and efficient. The room was nicely furnished, clean and comfortable. The only problem I had was with the shower, which would vary between cold and scalding and could not be controlled. Still this is a nice place to stay, and I will stay there again. Have stayed here and it was just as good as first time. For what you pay its hard to beat this place. Location is great, short walk to beach or to shopping. Easy to get anywhere. Rooftop pool is nice and not crowded. Gym is awful but most hotel gyms are. Food was ok and room service was very quick. Room itself was comfortable and had everything you need. Maybe could use a microwave. There are nicer places in Pattaya but not at this price. I have been to Thailand on numerous occasions and have to say this hotels ticks pretty much all the boxes. It has a decent location. It is near shopping malls, Has a variety of restaurants no more than a few minutes walk. It is also near the famous Pattaya nightlife with walking street a mere 10 minutes away. 9 of us stayed at this hotel and everybody was very happy with the hotel. The rooms have nice showers, safety deposit boxes that work. The beds are nice although pillows are very soft (I like firmer pillows). The air con and free wifi are both very good. No ants or roaches in site. The restaurant serves nice breakfast and nice food in general, which is situated on the roof top next to the pool area. The only draw back to the hotel is, at least temporarily, there is a building site next to the hotel and you can hear the construction noise by around 9am. This can be loud and interrupt sleep, especially if you are a light sleeper. It effects the side of the hotel that has even number rooms. I moved to the odd numbers rooms and here there was no noise. The reception service is brilliant with Bo and Guay both eager to assist with any queries and both extremely helpful and generally just really nice people. They happily gave me a different room when I mentioned that I had broken sleep from construction noise. They gave me an electric plug adapter to borrow during my stay. And generally delivered the goods on whatever query or request we all had. When you consider how cheap a room is (about 26 quid for a standard room), you could'nt ask for more. I have stayed in hotels twice the price and only provide half the experience you get from staying here. I recommend it all day long. Great staff. Good rooms. Good breakfast. This was my 4th stay at this hotel and it is as good as ever. Positioned near 2nd Road and a 10 minute stroll to L.K Metro entertainment area. The rooms are spacious with well appointed bathrooms. The hotel is kept very clean and the staff are always efficient and helpful. The rooftop swimming pool and breakfast area is a great way to start the day. THis is a decent and basis hotel which you really cannot expects too much given the cheap pricing. It is clean and the staffs have been helpful. Defintiely recommended for those who are looking for cheap and clean accomodation. Close to Second Road. Clean hotel. Good wifi. I enjoyed my stay at The Pattaya Bay Resort so much that I extended my stay. A good, reasonably priced hotel close to the delights of Second Road and L.K Metro. The rooms are older but clean with functional equipment. The security is good and the elevator works well. The rooftop restaurant next to the pool provides an adequate breakfast. The staff are helpful and the hotel is a good place to stay. Will be back again in October. Good value. Good internet. Good location. This was my second stay at this hotel. It is an older hotel but kept in a good condition, is clean with excellent staff. The breakfast is taken in the rooftop restaurant next to the swimming pool. The breakfast is adequate. The rooms are functional and have no problems. Showers are hot, everything works ok. The position is a short walk to the main Second Road and is in a quiet location. The building of the next door hotel is now complete. I will be staying here again soon. Recommended! Quiet, yet close to the action. Comfortable room. Good value. My first stay at Pattaya Bay resort was very enjoyable. The hotel is a bit dated and in need of some renovation but it provides all the budget traveler needs. The rooms are fine, the breakfast on the rooftop is a pleasant experience. The swimming pool, also on the roof, looks inviting although I never tried it. The staff are helpful and security is good. My first stay will not be my last..........I have booked again for later this year. I have stayed her a few times, the rooms are clean, has a large fridge in room, king size bed, typical Thai style bed and a verandah. Staff are helpful, although I don’t really need their assistance apart from check in and check out as I know my way around here. I choose to eat out although you can opt for breakfast at hotel, the restaurant is on the 7th floor overlooking the pool. However, they have started building in front of the hotel, don’t now if it is an add on or a new hotel or condo’s. Again, you pay for what you get. Nice stay in PBR. Staff is very nice and security within the building is excellent. Rooms cleaned well. Nice restaurant on roof top with inside and out side dining. Note the gym equipment is so out dated and quality is poor needs replaced not fixed ASAP.